This is part 1 of “The International 3 from my view”. Stay tuned for part 2, describing thoughts and events from the elimination stages at Benaroya Hall, in the next day or two! This is a semi-diary, semi post-competition gathering of thoughts and recollections, from group stages at the Westin Bellevue to the elimination stages at Benaroya Hall. I’ve tried to focus on giving a view into what the players are like, as well as some of the casual, random events that happened that I saw or was a part of, that can serve to bring behind-the-scenes stuff closer to normal fans. It’s a long read but worth it, I think, if you’re a fan at all of Chinese teams and players. I’ve not only written about Chinese teams and players, however, and there’s some other stuff too. I have to apologize in advance, because I am not the type of fan to take a lot of pictures with players, or to really intrude at all. I’ll chat with them if they make themselves available, and offer myself up to assist if it looks like someone needs it, but that’s about it — no autographs, no photos, basically nothing else. So, apart from my words and descriptions, I generally lack stuff to share with fellow fans. Hopefully you’re up for some reading, because there are a lot of words below! My first day involved was July 31. Met Hippovic, who showed me around. Then I just hung around at the Westin Bellevue while teams did their photo shoots and promotional stuff. Met various players. The next morning, Puppey sat down at the table during breakfast where Erik Johnson and I were sitting, and Puppey talked briefly with Erik Johnson about the infamous all-chat incident between xiao8 and Dendi… Then after breakfast, they had me translate for the players’ meeting that outlined some rules, expectations, and a general idea of how the event would go. That went… okay. I am not good in front of large groups of people. A camera is different because even though there are lots of people on the other end, I don’t actually see them. At the players’ meeting. So much talent in one room. 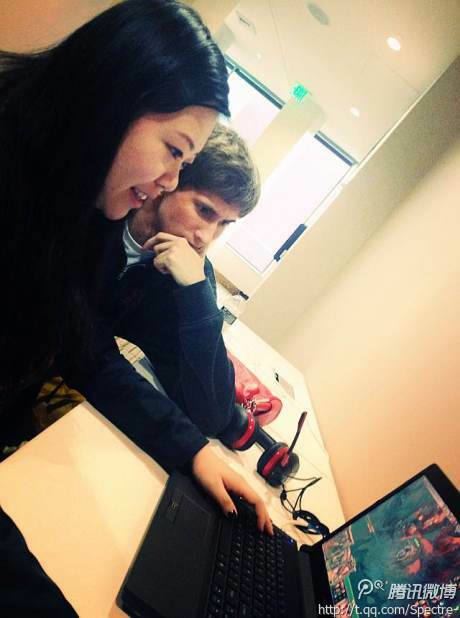 Later on during the day, Dendi sat down next to a fellow translator, Tracy, and began watching her play, as she was playing a pub match on a laptop. Tracy dismisses this, thinking it was Mouz Black, who had been hanging out with us earlier. Then I tell her to look over, and then she’s like, “omg it’s Dendi”. And Dendi sits there with an innocent look on his face. Then she got a kill, made another nice play, and both were met with Dendi getting up and dancing about nearby. Shortly afterwards, the meeting room internet at the Westin cut out (as it often did), Tracy got an abandon, and Dendi strolled off to entertain (or be entertained) elsewhere. Speaking of Mouz Black, who had made fast friends with a couple of us: We had taught him a few phrases in Chinese. He wanted to meet some of the LGD people, including LGD’s manager Ruru, but was apparently too shy to do so on his own. We taught him how to ask for a team jersey in Chinese (since he wanted an LGD set), and later on I taught him how to say the name of his favorite hero, Anti-mage, in Chinese. Much later on, some other Chinese kids must’ve taught him some not so savory words, because by the last day of the main event at Benaroya Hall, he was slinging them around until we told him that he should save it for when he really hates someone or something. Below, Black is saying 我想要一套队服, which means “I would like a team uniform”. Anyway, I tell LaNm, “When I saw you guys pick Storm Spirit, I knew you’d already won. LaNm responds curiously, “Why? I think it was because they didn’t have much in terms of disables.” But my opinion was simpler, “I just think you’re awesome on Storm, haha.” And he grinned. iG: Ferrari_430 was up to play the solo mid matches, so during the players’ dinner at El Gaucho, Erik Johnson grabbed me over to translate to get his picks for heroes, and to make sure he knew the rules. He hadn’t checked the rules before and was surprised that runes were allowed. This revelation in part caused him to change his initial pick from Lone Druid to Templar Assassin. He was sitting with his team and chatted a bit with them before deciding on his hero picks. Ferrari is a really friendly person in a really unassuming manner. I already admired his play and style, and after meeting him, I like him as a person too. After his and Mu’s first solo match, the TA match, which took over 40 minutes, they looked to me to ask if they could simply do the SF match next. When told that SF had to be third game, they decided to do Shadow Demon instead (whereas originally it was going to be OD as second match) to save some time. When I went downstairs to grab some water for 430 and Mu, I ran into XBOCT at the bar. He was seated, looked over to me, said “I like you”. I don’t think he really knew who I was then (or if he even really knows, now), but his friendliness had me asking him which of the Dota-themed drinks he’d had. He looks at the drinks menu and starts pointing. “All of them?” I ask. “Yes,” is his reply. Cool guy. During Mu’s solo match against Ferrari, Hao stood behind his chair for much of the time, joking and making suggestions. Hao even brought Mu a drink of some sort. He had two of the same drink, one for himself, one he gave to Mu. Aww. TongFu’s players seem to be the friendliest with each other (this is not to say that the other teams aren’t all quite friendly with each other). While the Ferrari and Mu match went on, several other matches came and went. Iceiceice versus s4 was funny in that iceiceice giggled whenever something happened, especially whenever he used his coal. DK: rOtK is just as fierce in person and out of game as he is in-game (and at LAN events). He also seems like a very sincere person, and he’s got an amazing sense of humor and quick wit, more than once causing uproarious laughter in the Chinese section of the viewing lounge at Westin. He wears his heart on his sleeve, a rare specimen amongst your average Chinese player. iG: The iG players tend to be more quiet, though YYF can really talk, and talks quite fast, when he has something to talk about. Ferrari is very thorough whenever you ask him about something; in the mini-series with Soe where we asked players for their ID and what it came from, Ferrari_430 was by far the most thorough in explaining. He also likes to hold the mic himself when he’s talking (he was the only player with this preference). I’m not sure why his part was cut out from the final player ID video that was posted online, though. But his ID is pretty self-explanatory anyway: he likes that car, and the name of it was what he went with when registering himself on a gaming platform in the past, and it stuck. Speaking of player IDs, I wish we could’ve gotten more, especially more of the Chinese players, but unfortunately it was not to be. In the final two days, I did some interviews with Perfect World, helping to translate Chinese questions to Western players, then translating their answers back. Additionally, I worked on the final versions of all the subtitles for team intro clips that they played before each team’s first appearance at Benaroya Hall this year. That took a while, because I needed to fix up the translations, the grammar, and then the timing of the subtitles as well. A lot of fun seeing my work up on the big stage later on, though. Anyway, player IDs. The teams and players were in and out as well, playing matches, going out for dinner, etc. Maybe there’ll be more chances in the future for this. The player ID vid, as posted, is below. Whenever I’m not on camera, I was the one running the camera! ;P The Orange players were all so polite, and seemed a little bit shocked that anyone would want to ask them anything. 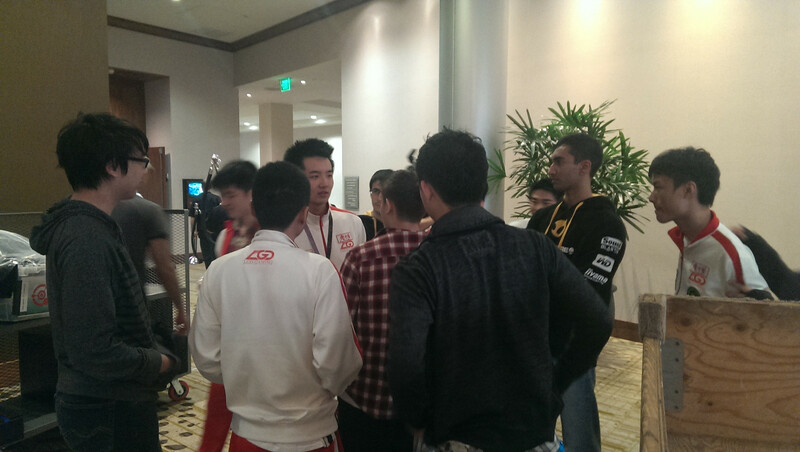 LGD: I think it was on this day that xiao8 was recognized in the lobby of the Westin Bellevue by a visiting group of Chinese tourists. An older Chinese man and his wife are walking out of the elevators while xiao8, his friend, and a few of us are waiting to go up, and the man turns around, peers at xiao8 and goes, “Aren’t you that guy on the TV? The dating show? Were the scenes in the show real or staged? Xiao8? …You’re here to compete!” Xiao8 confirms that the show and its result were not staged, and then just nods a bit, not sure how to respond. The man and his wife grin widely and wish him luck as we walk into the elevator. In the elevator, I remark that he’s a superstar now. Xiao8 smiles lightly in a way that suggests he doesn’t necessarily embrace it, and goes back to whatever he was doing on his phone. RattleSnake: LaNm needs glasses. He had trouble seeing the screen while watching matches on the screens in the players’ lounge at Westin and constantly had to squint. So I told him to go get some glasses. “Yeah, it’s indeed time to get glasses,” he replied. You can sort of see LaNm straining himself to get a clear view of the screen from where he’s sitting. He’s leaning forward with his arms folded underneath his head in the center of the picture. As seen in some of the panoramic photos so far, the teams and players mostly mix pretty freely. There’s a pretty clear divide between Western and Eastern, and then within that there’s another less clear divide between Chinese and SEA, and between Russian and non-Russian. But by and large, the players are friendly and cordial with each other, and most every player is willing to meet and get to know another player. A rare few players have the talent of slipping almost seemlessly between all the different groups (though they still have their own preferences). The Chinese teams seem to especially be friendly with one another, and when they weren’t competing, there would be intermingling to the degree that, to an untrained eye, you wouldn’t be able to pick out which players were on which teams at all. Also, Black^ and Bulba partook in an activity they called ‘Ghost Ship’, in which they would ambush unsuspecting fellow players, pick them up, then put them down unceremoniously whilst shouting “ghost ship!! !” I saw them do this to two or three different people, and I don’t think anyone much enjoyed it. I am also wondering if they meant ‘Torrent’, as in Kunkka’s Torrent, which gushes someone up then drops them down. LGD.cn and Dignitas played a tiebreaker, a close one. Afterwards, the two teams seemed to be pretty cheerful, even gathering together briefly to chat a bit. Throughout the group stages, there was an on-going joke amongst the Chinese players that whenever someone stepped out for a smoke break, the Chinese team currently playing would lose. Hao in particular would come back inside after a break outside, and exclaim, “What? Lost again?? ?” This is another reason to not smoke, kids. It was just a joke, but later on in the group stages I did hear comments at least once or twice about waiting to go smoke until after the game had ended. Haha. Either way, the Chinese teams in general seemed pretty loose and relaxed, joking amongst each other, chatting about the games going on and other things. It was cool to see the players in a more casual environment. 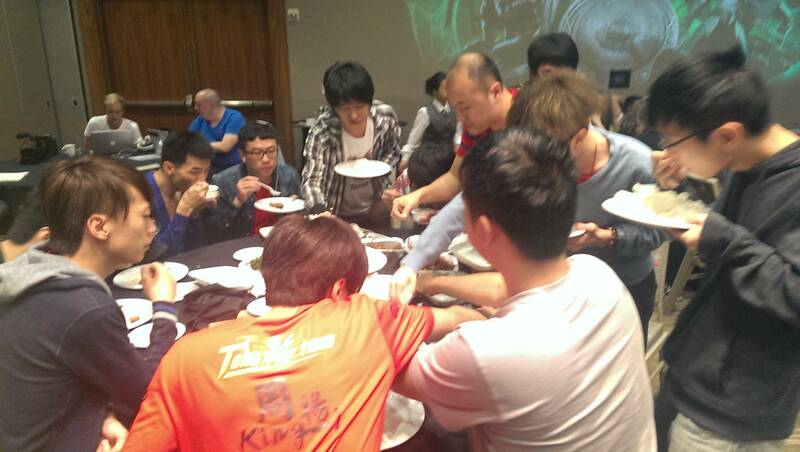 In the afternoon, with the group stages finished, there were Valve tours scheduled. A group of 13 of us got stuck in the elevator going up for nearly an hour. Amongst us were Black and Synderen from Mouz. Both of them can be pretty funny. The PC Games reporter that was stuck with us in there was also a funny dude. I think they contributed to keeping morale high in there. It took an hour of rising temperatures in the elevator, and a call to the fire department after the original elevator tech never showed up, for us to finally escape. 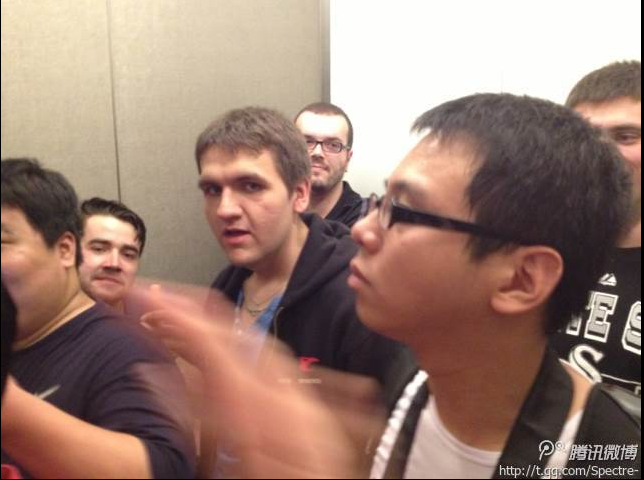 When we ended the Valve tour, Synderen and I both, on two separate occasions, actually joked to one of the Valve people that “some of the guys got stuck in another elevator”, which brought a momentary look of shock and worry. Sorry to the Valve lady, it was probably not the best joke to make again given the earlier events. They did give us some extra stuff in our goodie bags at the end of the tour. It was probably worth getting stuck in the elevator. I won’t bother posting pictures from Valve offices because, well, I didn’t bother taking any, and other people have posted plenty of pictures already anyway. 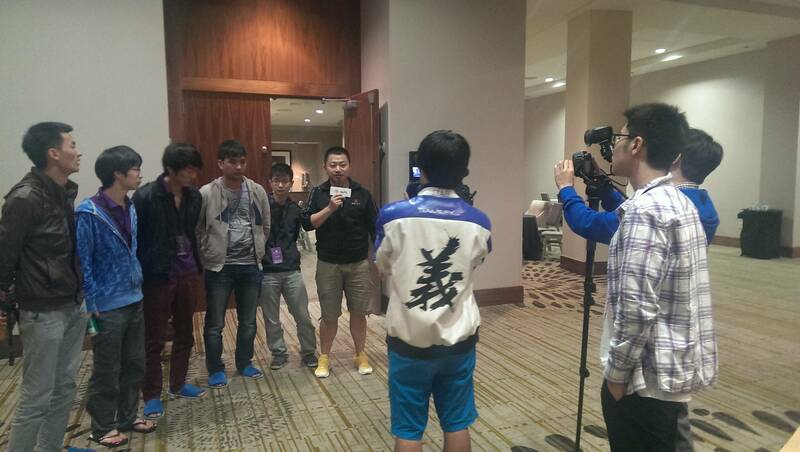 All in all, the group stage at Westin Bellevue was quite an intimate, low-key kind of event. Players would just sit and hang out in the lounge with the games on screen for hours on end. 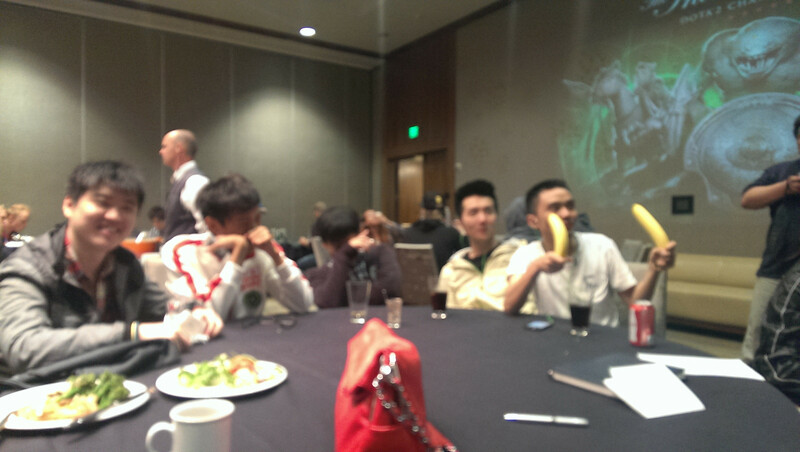 Food would come and go, Valve admins would come in and shout for the next team up, the team that just finished would come back in and sit down and grab some food and drinks… It would be such a huge contrast to the high pressure, high energy atmosphere at Benaroya Hall and the elimination stages. This was part 1 of “The International 3 from my view”. Stay tuned for part 2, describing thoughts and events from the elimination stages at Benaroya Hall, in the next few days! ← Which players would you like to hear from, and what would you like to ask? More! This is so good. Keep up the great work AutumnWindz, we really appreciate your content and thoughts. Really enjoyed reading this, it was pretty interesting hearing about the elevator incident aswell as how players (especially the Chinese) react to this years event. Please post more!! Yes! Part 2 coming soon. very touching. and happy to see someone is taking care of these young man. good job! Thank you! That was one of the highlights for me, to be able to do that for them. Thanks for the writeup, This is a different side of coverage which most sites didnt have! Pingback: The International 2013 in my view (part 2) | Dota 2 CN -- Dotaland!